– The LRX 1V3 D024 power supply produces a direct-current voltage to power the LRD base and expansion modules in circumstances when 24VDC is not available in the application. 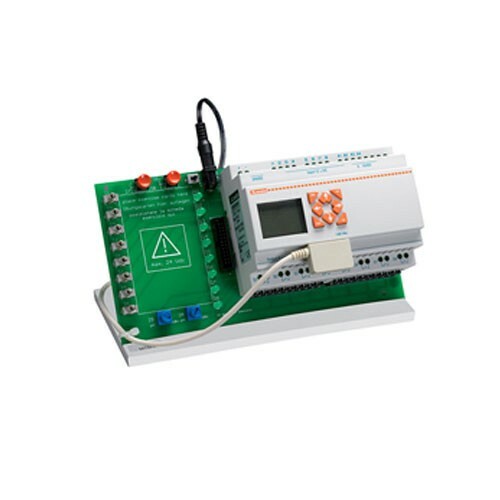 The power supply can also be used to power eventual 24VDC auxiliary circuits. – The LRX M00 backup memory allows to save the user’s program and to simply and quickly transfer it to the base modules. – IEC degree of protection: IP65. At any time and with extreme simplicity, LRD can be set up and reprogrammed to satisfy new requirements and improve the operation of a system. Programming is simple and intuitive and can be done directly on the base module keypad or by personal computer, connected by LRX C00 (RS232) or LRX C03 (USB) interface and using the relative LRX SW software. With a personal computer, two programming language locs can be used: FBD (Function Block Diagrams) and LADDER (contact scheme). – Simulate the program directly “off-line” on a personal computer to test if it runs correctly. – Use the supervision mode to check the project “on-line”. There are 8 function keys on front, dedicated to onboard adjustment, control and supervision of digital input and output status, analog input values, time and date entry and the operation status of the micro PLC itself. Certifications obtained: UL Listed, for USA and Canada (cULus - File E300049), as Programmable Controllers for power supply and HMI units and base module of kits. Compliant with standards: IEC/EN 61131-2, UL508, CSA C22.2 n°142.